There is a “compelling case” for a metro scheme for Greater Cambridge after a feasibility report has claimed it could create 100,000 jobs and 60,000 new homes, but could cost £4bn. 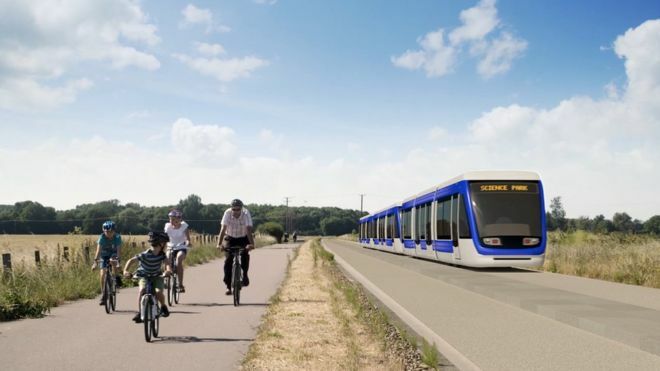 The feasibility study was commissioned by the Cambridgeshire and Peterborough Combined Authority (CPCA), and mayor James Palmer declared there was a compelling case for the new regional transport network covering 88 miles. Other details of the Cambridge Autonomous Metro include. It would use trackless electric vehicles. Across Cambridge in twelve minutes. 7.5 miles of underground corridors under the City. Cambourne, Haverhill, Huntingdon, Mildenhall, St. Ives, St. Neots and Waterbeach would be served. I think that the route network is feasible and if any City in England can fund such a scheme it is Cambridge. I can see the point about trackless electric vehicles, as illustrated by this picture. It looks to me, that the track is just a road with a cycle track alongside. But would it be better to use tram-trains and the Karlsruhe model? This would enable the system to use the heavy rail tracks to Bury St. Edmunds, Ely, March, Newmarket and Wisbech. Bury St. Edmunds certainly needs a frequent service to Cambridge. East West Rail Consortium has a plan for a Parkway station on the A14, which needs a frequent connection to Cambridge. Hopefully, tram-trains have been rejected for good reasons. But does the proposed system fit well with the East-West Rail Link. your comment software seems to be making a hash of the link – include all the link, including the pdf bit with the two dots.